God’s got the overall plan for me under control, so I’m just working on the little stuff here on my end! On this post, I’m kicking back with a cup of coffee while I reflect on this past week, look forward to the one beginning, and do what I can to make the week more successful for all of us here at ExpatPrep! Since school has started, we’ve been making it work, but I don’t really feel like we’ve settled into a good routine for our evenings. This is especially obvious when I look at the boys and realize that each has been acting out in specific ways. P-Daddy and I have decided that our strategy will be to divide and conquer shower each with more individual attention. In essence, we’ll each buddy up with one Kiddo each night for activity, bath, reading, and quiet time. The boys will have less opportunity to feed off of each other’s inappropriate behavior, and hopefully, the individual attention will better meet the needs of all involved, me and P-Daddy included! Deep-cleaned the fridge – and it really needed it! Made a definite plan for a gal-pal vacation – I cannot wait! I am finally done with my Fuel Cycle (down about 5 pounds total – woot woot! ), but it promises to be a busy week, so I’m keeping it pretty simple this week. I’m so excited that it’s the time of year that pumpkin shows up everywhere, and you’ll see it featured in several different places on this menu. Meals here follow Trim Healthy Mama guidelines, and are marked as S (= Satisfying), E (= Energizing), and FP (= Fuel Pull). I think that one on one time with kids is so important during this part of the year when things get so busy with schooling. I need to deep clean my fridge this week before it gets slam full of groceries again, thanks for the reminder. I really need to check out this diet plan you are in, is it hard to get accustomed to? Thanks for linking up again this week. Felicia, the Trim Healthy Mama plan is pretty straightforward once you understand the basic principles. The Facebook groups are a lifesaver, but you really need the Trim Healthy Mama book to make it workable. Let me know if you have questions about it! I loved your pictures! I like to look at photos like that and see how the children progress. Oh gosh, you reminded me that my fridge is in serious need of a good cleaning out. The bright shining shelves in my fridge make me so glad that I took the time to clean it! What’s a bubble bath? BHAHAHAHAHAHA! 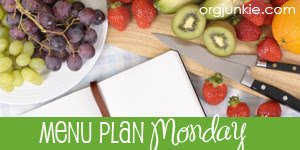 Thanks for linking up your meal plan at Trim Healthy Tuesday!